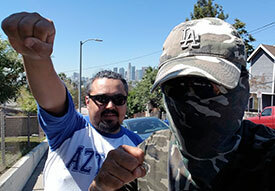 Militant Angeleno: The Militant's 2012 Lotus Festival Report! The Militant's 2012 Lotus Festival Report! This past weekend, The Militant, along with thousands of other Angelenos, enjoyed a weekend in wonderful Echo Park for one of Los Angeles' best outdoor Summer traditions - the Lotus Festival. The Militant has covered it year after year, and this year is no exception! Though it was kind of humid the entire weekend, that didn't stop Angelenos from going to Echo Park and partaking in Asian/Pacific Islander culture for the weekend. There were wonderful music and dance acts that wowed the crowd the entire day. As you can see below, a large number of people sat on the grass being entertained, while a row of clothing and crafts vendor tents stood between them and the northern edge of the lake, with the park's trademark lotus flowers in full bloom! Don't they look beautiful? Unlike past years, The Militant made it a point to get to the festival early enough to catch one of the festival's most cherished traditions -- the Dragon Boat Races! The Lotus Festival is pretty much the same every year, but the smiles on the diverse array of Angelenos' faces never gets old on The Militant. And to see an urban jewel such as Echo Park Lake shimmer under the summer sun, with tens of thousands of people encircling it, it's such a sight to behold. May we never see anything that strays from this sheer beauty. Wow. I'm genuinely sorry I missed it!